This group mission begins with Zebuxoruk in The Void (H). - Say "few" to request the mission and "set" to zone in. - Say "begin" to Zebuxoruk to begin the event. - Don't fall off the ground, or you'll die. - There are five rifts spread throughout the zone; you need to close them. --- Rifts start out at "100% Strength" (level displayed as a title under their name). --- They will decrease in strength as you kill mobs on their respective isles. --- Each Rift has a relic associated with it; you can click a relic to inhibit its associated Rift's mobs. ------ Relics share a 45-second cooldown timer. - First, you need to clear the four islands (no particular order; mobs spawn about 10 seconds after you port onto an island). ------ Casts "Outlast" (mitigates DOTs). ------ Casts "Repel" (mitigates melee damage). ------ Casts "Withstand" (mitigates spell damage). --- The Claymore can be clicked to prevent him from using defensive buffs (stops for 45 seconds). --- Kill Grundehl to destroy the rift. --- "a skirth ripper" (mezzable; stunnable) mobs spawn (appear about 20 seconds apart, 10 mobs total). ------ Cast "Scent of Blood" (lock hate on random target). --- Selo's Drum can be clicked to prevent skirths from using their abilities (locks mobs out for 45 seconds). --- Kill 10 skirths to destroy the rift. --------- Every 15 seconds, checks difference between its current health and its previous health. --------- If greater than 15% difference leads to "Greater Heal" cast (heals 15% health). --------- If greater than 8%, but less than 15%, leads to "Lesser Heal" cast (heals 3% health). --- Scroll of G`Han can be clicked to prevent Borleoth from using "Greater Heal" and "Subversive Healing" for 45 seconds. --- Kill Borleoth to destroy the rift. --- "a gehein soulcrusher" (mezzable; stunnable) mobs spawn (appear about 20 seconds apart, 10 mobs total). ------ Cast "Mirrored Skin" (reflects spell and melee damage). --- Ro's Flame can be clicked to remove the buff and prevent them from casting it for 45 seconds. --- Kill 10 geheins to destroy the rift. --- Once the above four rifts are destroyed, Zebuxoruk becomes attackable (after a script unfolds). --- DPS Zebuxoruk to 30%, at which point he goes non-aggro. --- Lanys T`Vyl, as trustworthy as she is, becomes aggro after Zebuxoruk is handled (again, after a script). ------ Casts "Swordplay Technique" (various PBAE, directionals, and beams). ------ Casts "Lifescourge" (175' range single-target beam that reduces max hitpoints by 12%). ------ Casts "Lifesap" when below 70% health (lifetap on random target). ------ Casts a random target aura-based targeted AE "Fires of Hatred" when below 35% health (get out of aura to avoid). ------ Casts "Voidcast" when below 20% (knockback spell - don't fall off the island!). - NOTE: If you need some time to med up before engaging either Zebuxoruk or Lanys T`Vyl, you can port back to one of the side islands to avoid their aggro. Be warned, however, that the event has a reset timer if left idle too long (timer is not known). If you need downtime, take as little time as possible. - Defeat Lanys T`Vyl to complete the event. You have been assigned the task 'The Journey Home'. The relics have been gathered, and the ceremony is ready. Zebuxoruk and Lanys T`Vyl need you to send Lendiniara on her journey home. Speak with Zebuxoruk to begin the ceremony, and then do whatever is necessary to send Lendiniara home. 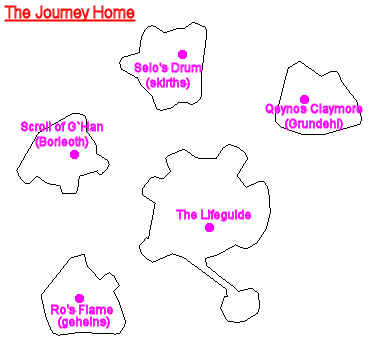 You have entered The Journey Home. After you say "begin", you need to clear the four side islands. You can do so one at a time, and there is no particular order. Once all four islands are defeated, return to the center island and be ready for Zebuxoruk to go aggro (a short script unfolds first). Once Zebuxoruk has been subdued (DPS'd to low health), be ready for Lanys T`Vyl to go aggro (again, after a short script unfolds). If your group isn't ready for Zebuxoruk or Lanys T`Vyl, you can port back to one of the side islands to avoid their aggro while you med up. Be warned, however, that event has a reset timer (exact timer unknown), so don't take too long. Shortly after stepping onto the southwest island, mobs called "a gehein soulcrusher" begin spawning. These see invisibility and are buffed with "Mirrored Skin" (damage shield for 2,800 dmg per hit + 20% chance to reflect spells). They hit for a max ~8,000 (no flurry; no rampage). These mobs are stunnable and mezzable. A total of 10 spawn, but only three can be up at one time. Note: You can click Ro's Flame to temporarily remove their buffs. a gehein soulcrusher has been slain by _____! Once all 10 geheins are killed, you're finished with this island. Shortly after stepping onto the west island, Borleoth appears. He sees invisibility, so be ready for a fight. Borleoth hits for a max ~14,000 (no flurry; no rampage) and is immune to all forms of crowd control. Borleoth casts "Subversive Healing" on his target (reduces incoming heal effects by 30%) and AEs "Defiling Discharge (AE DOT for 14,500/tick for 10 ticks). Borleoth also has health-based heals. Every 15 seconds, he checks the difference between his current health and his previous health. If the difference is 15% or greater, he casts "Greater Heal" (heals 15% of his health). If the difference is between 8% and 15%, he casts "Lesser Heal" (heals 3% of his health). Borleoth leaks out a defiling discharge! Borleoth heals from its minor wounds! Note: You can click the Scroll of G`Han to prevent Borleoth from casting "Subversive Healing" and "Greater Healing". Borleoth has been slain by _____! Once Borleoth is slain, you are finished with this island. Shortly after stepping onto the north island, mobs called "a skirth ripper" begin spawning. These see invisibility and lock aggro on random targets. Their max hits vary according to the class of the player on which its aggro is locked. These mobs are stunnable and mezzable. A total of 10 spawn, but there is a maximum number that can be up at one time (three?). a skirth ripper smells _____'s blood! --- Casts "Scent of Blood" on target, locking aggro. Note: You can click Selo's Drum to silence the skirths. a skirth ripper has been slain by _____! Once all 10 skirths are killed, you're finished with this island. Shortly after stepping onto the northeast island, Grundehl appears. He sees invisibility, so be ready for a fight. Grundehl hits for a max ~14,000 (no flurry; no rampage) and is immune to all forms of crowd control. Grundehl defends against persistent spells! Grundehl defends against physical attacks! If you do 400,000 damage before his buff wears off naturally, he AEs "Retaliate" (PBAE 50' range; 36,000 dmg unmitigated). Note: You can click the Qeynos Claymore to prevent him from casting these buffs. Grundehl has been slain by _____! Once Grundehl is slain, you're finished with this island. Ethernere still seeps through an open rift! As soon as you see the third emote above, he becomes aggro (summons from 100% health). Note: Cyclonic Sickle is cast throughout the entire fight, and Imprison is cast after he passes 60% health. Zebuxoruk begins to spin his sickle! --- 10-second warning to "Cyclonic Sickle"
Zebuxoruk unreals a length of chain! --- 10-second warning to "Imprison"
Zebuxoruk lashes out with chains! --- Seen as he casts "Imprison"
DPS Zebuxoruk to 30% health, at which point he stops attacking. Lanys T`Vyl raises the Lifeguide. 'Let's see how powerful this staff truly is!' As she holds the staff aloft, the final rift closes. Lanys T`Vyl hits for a max ~21,000 (no flurry; no rampage). Every 40 seconds, she AEs "Swordplay Technique" (four versions of this spell, cast randomly, some directional, one of them PBAE) which does 16,000 to 19,000 (unmitigated) damage. She casts "Lifescourge" on random targets (reduction of max hitpoints by 12%). When below 70% health, she adds "Lifesap" to her arsenal of spells (lifetap for 93,500 unmitigated damage). When below 35% health, she begins casting the aura-based "Fires of Hatred" (20' range targeted AE inside the aura for 12,500 dmg). When below 20% health, she begins casting "Voidcast" on random targets (knockback + DD for 86,300 unmitigated damage). DPS Lanys T`Vyl to about 2% health, at which point she goes non-aggro. Zebuxoruk whirls his sickle and slashes Lanys across the face. She falls to the ground, bleeding, and the Lifeguide tumbles from her grasp. Lady Lendiniara looks upon everyone gathered in the Void. 'Adventurers, I will never forget the sacrifices you have made and the trials you have undergone. Your deeds have saved countless worlds. I must return to my home before the last rift closes forever. Farewell!' Lendiniara, the Lifeguide, and the final rift disappear in a shower of light. Lady Lendiniara is ported away, and Lanys T`Vyl recovers. Lanys T`Vyl rises, blood still running down the gash in her face. She spits a spray of red and laughs maniacally. 'Filthy, stupid peasants! You thought I would destroy the world, so you took away my staff? I can find another one; I know where to look! You wouldn't believe half the things I know now after holding the Lifeguide in my hands! You have defeated Lanys T`Vyl and sent Lady Lendiniara back to her world. The Ethernere rifts have been closed, and Norrath is safe once again. I have only done burnout, but he gave me the mission anyway. You really dont have hardly any time to wait after the 4th island is cleared. I thought I could wait a minute to regen mana but it failed me for it. The Fall of Lord Bayle is not required to request this mission from Zebuxoruk. I haven't completed that one yet and just requested this mission from him successfully. The event WILL reset if you wait too long to agro Zeb. Also, if you fail on Zeb you have to redo all the islands again. It seems the Manifested armor does not drop all that frequent in any mission ... seems to be an uncommon event. Maybe it's just the roll of the dice, but my drop rate is like 1-2 in 10. Mug of Eternal Ale + nothing dropped last night. This task is tied to achievement Hero of WK3, and the greater Legendary Hero of the Call achievement which yields Hero's Calling as a reward. Nice aug!